A few days back, we at AMIS got our cloud trial for Oracle Management Cloud. I can now report from my first steps with Application Performance Monitoring, one of the key components of OMC. 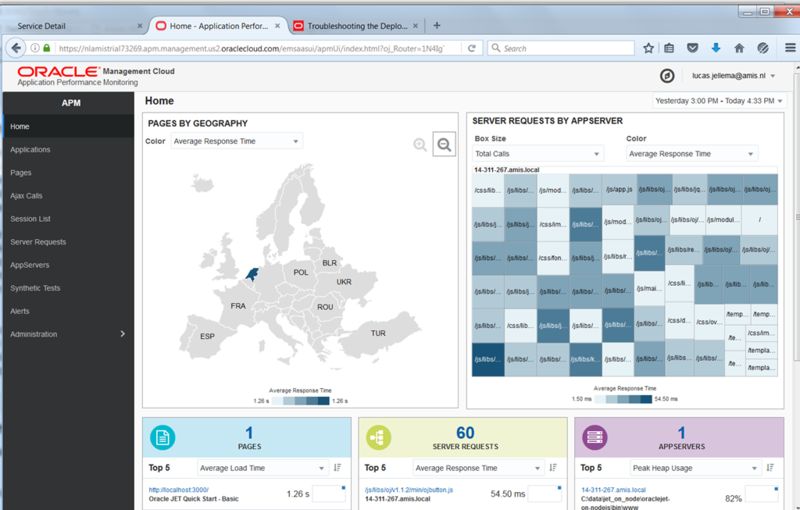 Application Performance Monitoring (APM) is clearly indispensable to any organization adopting a DevOps approach – and frankly required for any organization in general running applications to support business objectives. 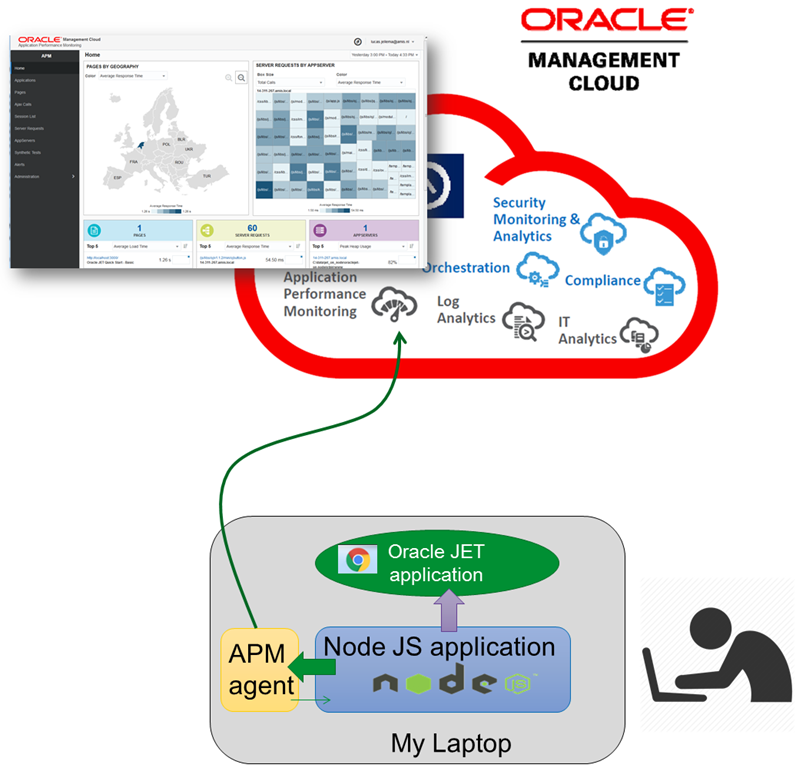 APM provides insight in the non-functional behavior of applications – or better yet: of the business functions provided by these applications. 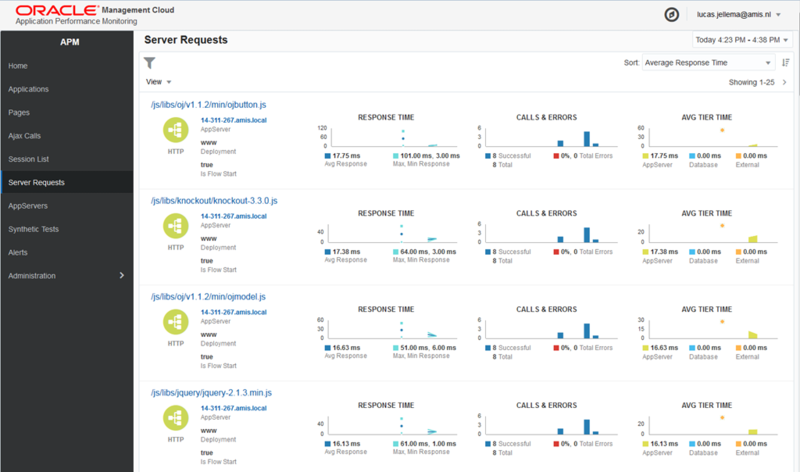 It alerts administrators to functions that have unacceptable response times or are at risk to display poor performance and it allows us to analyze these situations to figure out where in the application stack – front end, services, integration flows, database, etc. – and in which specific component the problems have arisen. After performing this type of root cause analysis, resolving the problem still needs to be done, but is kick started as early as possible and with as much analysis details as possible. 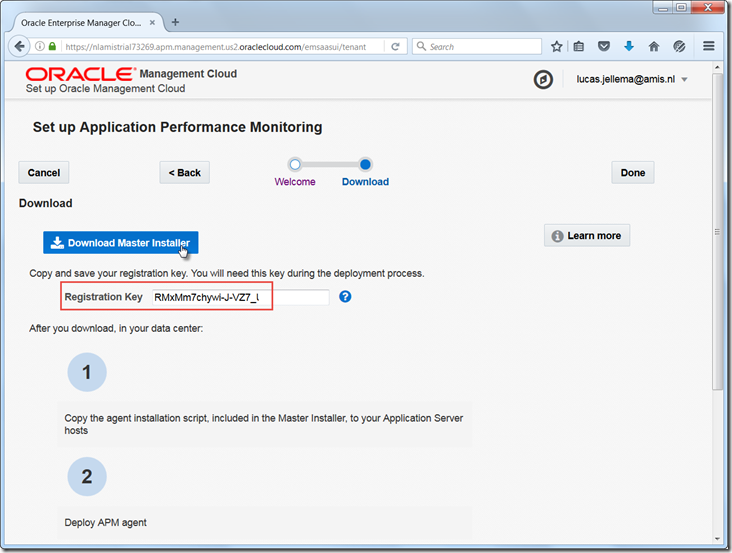 In this article, I will describe the very practical steps I took to go from having my trial provisioned to having my first application monitored in the dashboards of APM. At this point I will not yet have very compelling analyses to describe – but I do have a dashboard and my first alerts sent to me. 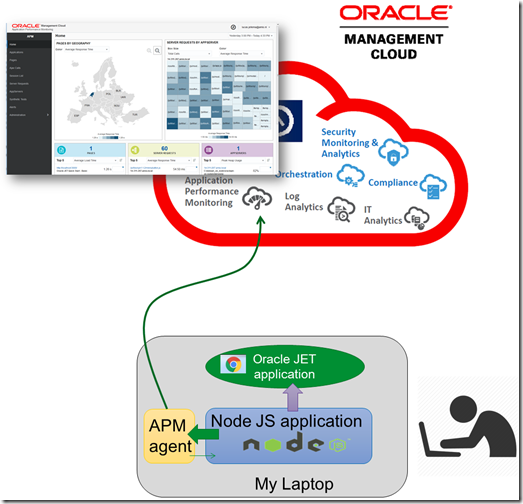 This picture visualizes my set up: a local Node.js environment on my laptop, running an application that responds a HTTP requests by serving up an Oracle JET application with all of its resources (static JS libraries, CSS files, images etc). 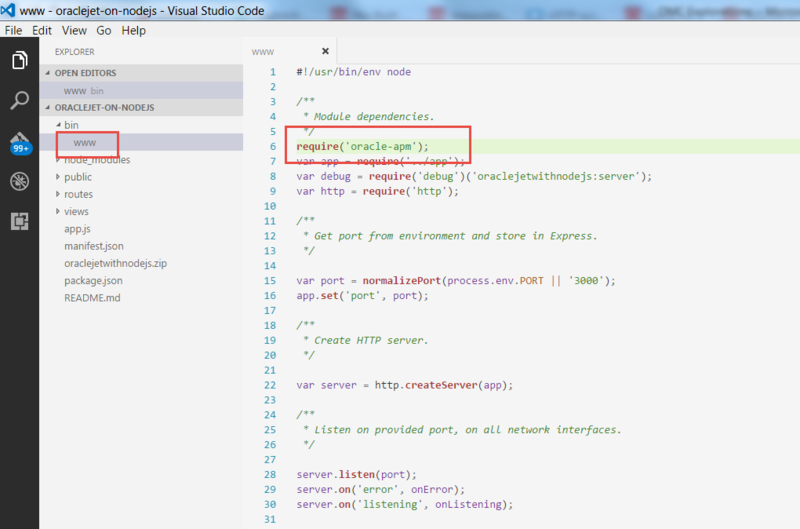 The Node.js server is configured for oracle-apm as is this particular Node.js application. 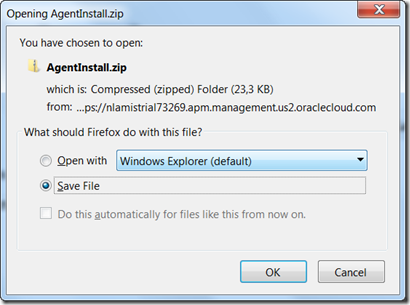 When the application is running, the APM agent is activated. The agent gathers details and metrics – and sends these details to the Oracle Management Cloud environment. Here, these details are collected, stored and processed. They can be visualized in a dashboard, used for analysis and for example lead to automated alerts when specified alert conditions are identified. Let’s take a look at the steps I took to get my pre-existing laptop, Node.js environment and application hooked up with APM. Note: most steps come straight out of the documentation – except for two that I will mention explicitly. Set the STAGE_DIR and NODE_HOME environment variables, to the extraction directory (d:\omc) and the installation directory of the local Node.js instance (“D:\Program Files\nodejs”). This creates oracle-apm as a global node module under the the node_modules directory of the Node installation on Windows: <USER_HOME>\AppData\Roaming\npm\node_modules as shown below. 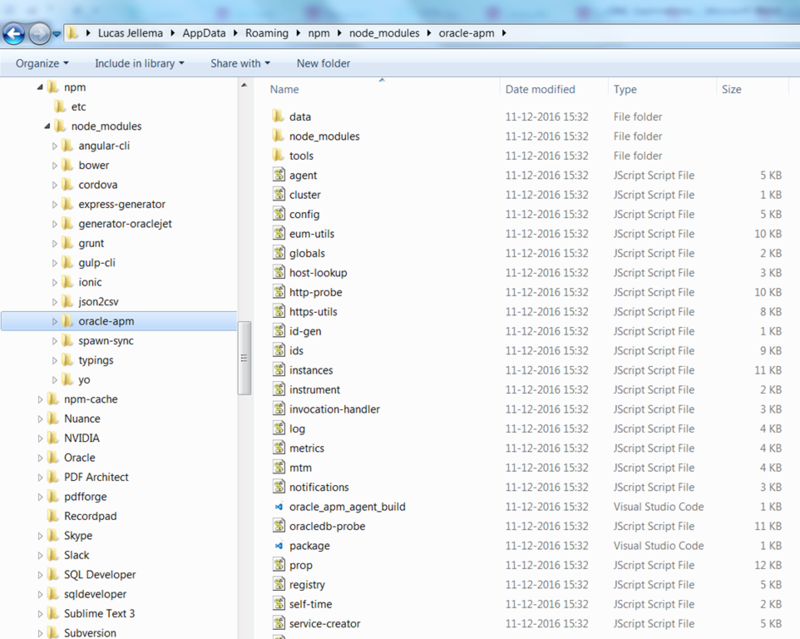 in project/application folder. See http://stackoverflow.com/questions/7970793/how-do-i-import-global-modules-in-node-i-get-error-cannot-find-module-module for details. 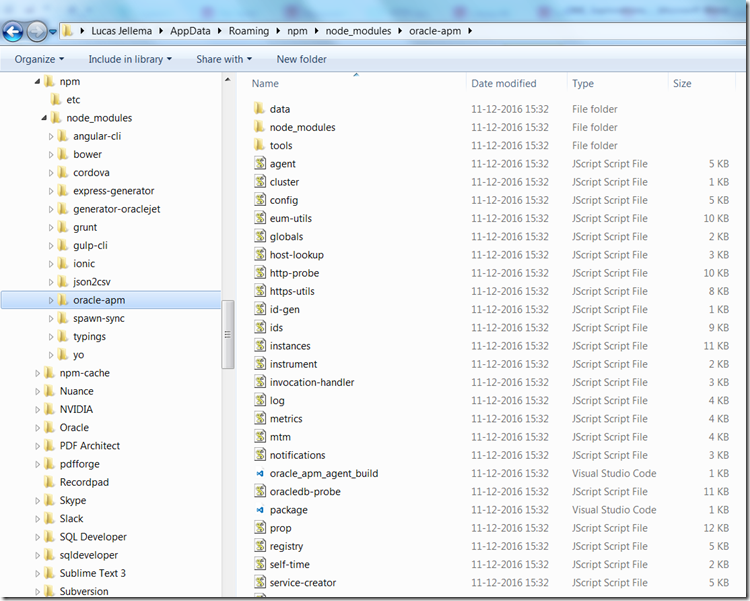 One directory is /logs that contains… the log files! 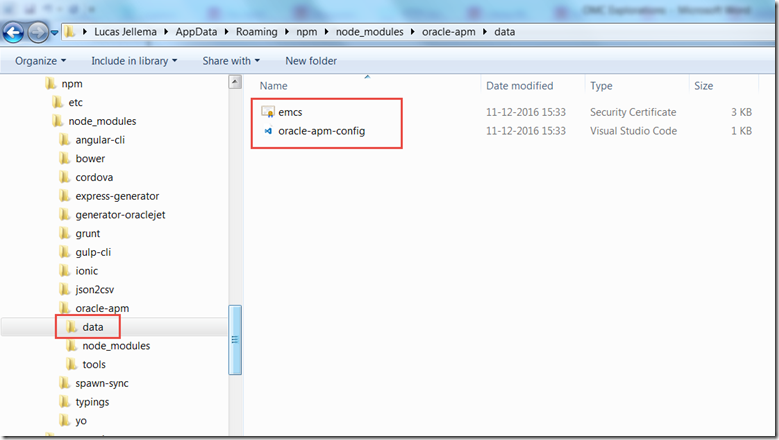 These files contain all details about the APM agent and what it does regarding the Node.js application. 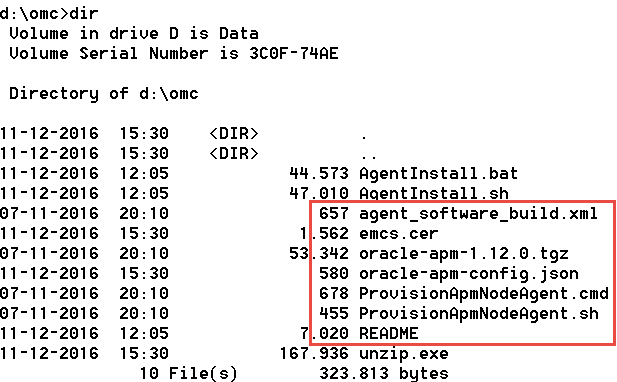 It is this file that tells us more about the success of running the APM agent and of collecting metrics and sending them to the OMC cloud. 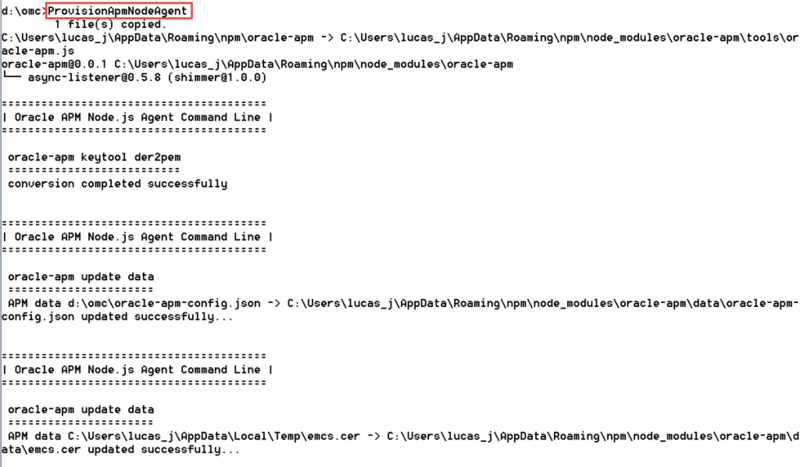 Taking a closer look at the log file, we see two errors. 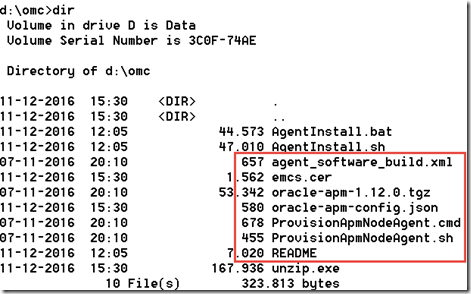 One is expected (says the documenation: http://docs.oracle.com/en/cloud/paas/management-cloud/emcad/verifying-apm-node-js-agent-installation.html ) – […]Error: ENOENT: no such file or directory, open ‘C:\data\jet_on_node\oraclejet-on-nodejs\bin\oracle-apm\identities\AgentIdentity_www.json’. The second should not have been there: ,failure message: unable to get local issuer certificate. 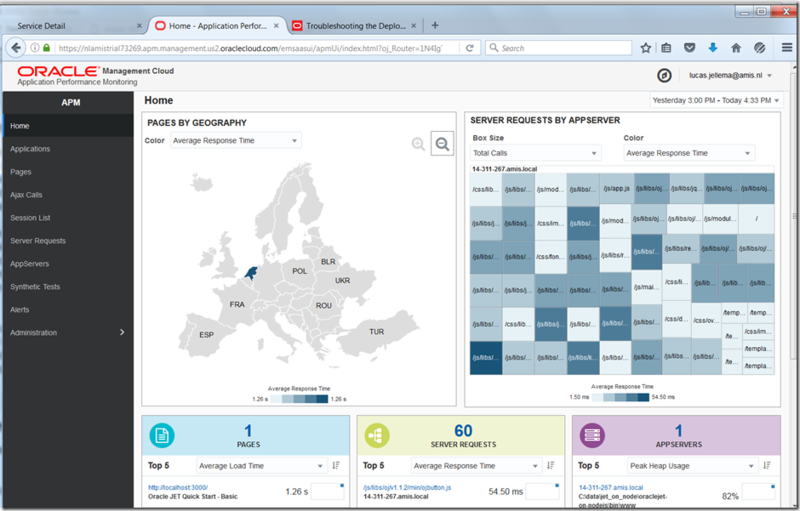 The homepage of APM shows a dashboard with various visualizations. All data shown here have been sent to APM by the local agent in Node.JS application, the application running locally on my laptop sitting on my kitchen table in Zoetermeer. Most squares in the treemap represent JS libraries loaded from Node.js from the browser when the JET application was first accessed. After this initial load, there is no interaction between client (browser) and server (Node.js) and there is no database involved. The analysis we can do with APM for this particular application is extremely limited. However, we can still get a good overview of how many calls were made to the Node.js server and how long each of these took. 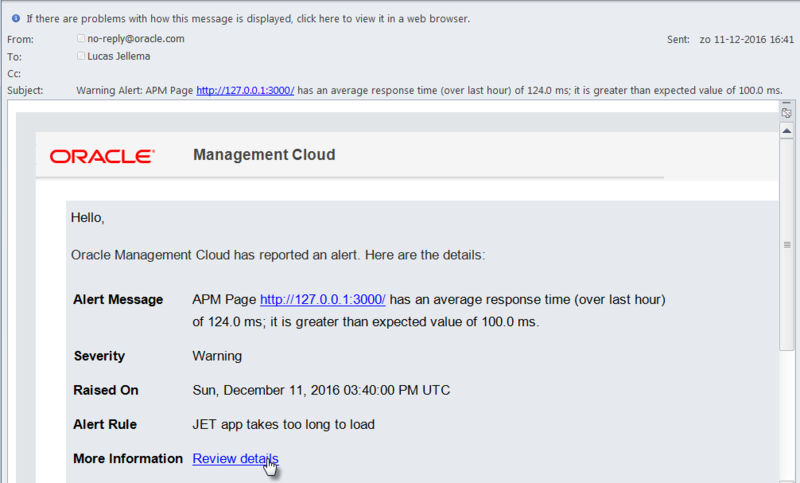 We can even define alert rules – to have us send an email when the response time is too long. 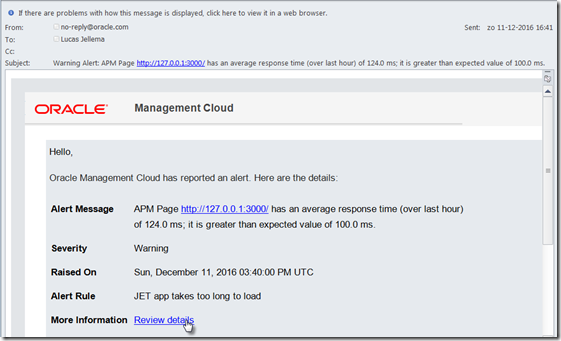 Here I specify that an alert should be raised on the warning condition – average Response Time for a specific Page is longer than 100 ms – and on the Critical threshold – the average Response Time for a Page crosses the 400 ms threshold. quickly reveals the details belonging to this particular alert. It is quite clear which page has raised the alert. We can investigate which requests took place, from where these happened, and what was done to handle the requests; this will help us find out the requests that took the longest – and why that was the case. Meaningful conclusions about the application were not yet found. However, we are now in a position to start monitoring the application and find anything worthwhile to be found about the application in the area of non functional user experience and the underlying causes. 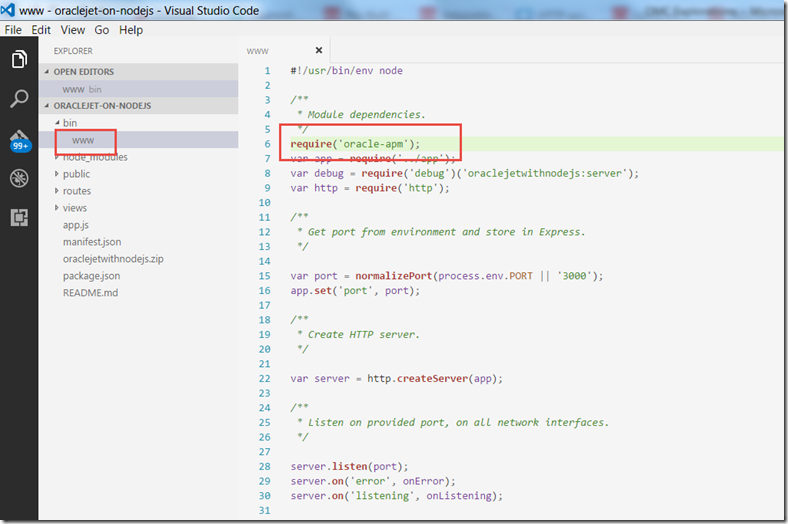 Hooking up a Node.js application with APM turned out to be fairly straightforward. 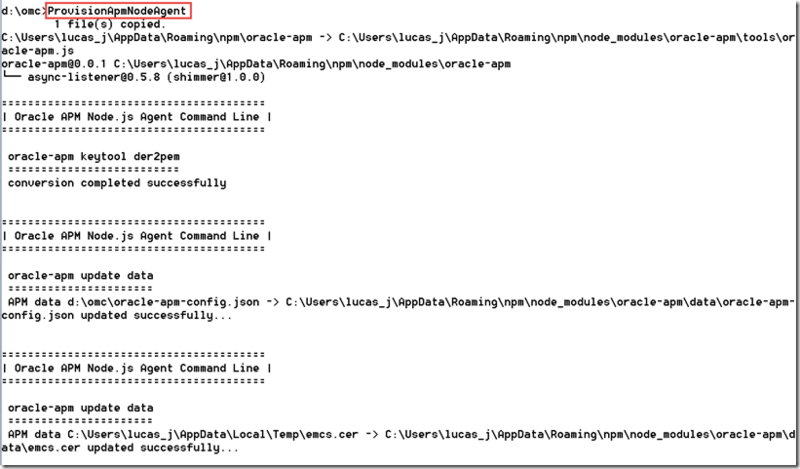 Next up are perhaps monitoring a Java, ADF or SOA Suite application. And monitoring IT components. 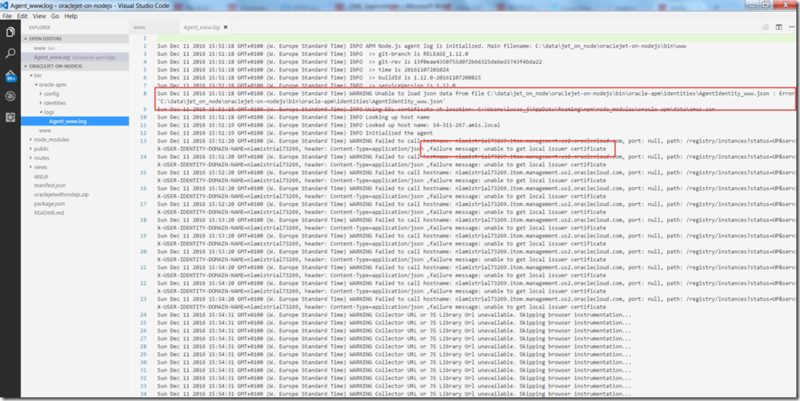 And analyzing log files. Stay tuned for more stories. 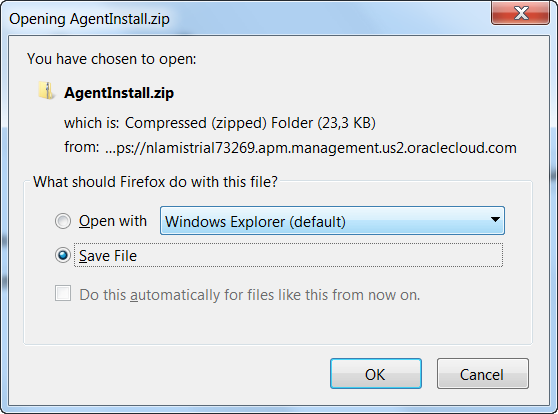 Try including the parameter ‘-download_only ‘ in your download statement.